Not since WWII has America experienced the kind of skills shortage we are facing as baby boomers leave the workplace and retire. The Bureau of Labor Statistics estimates that, by 2020, the skilled labor shortfall in the United States will be nearing 10 million people. A quick search on the popular employment site, Indeed.com, shows this phenomenon reaches across both blue and white collar jobs, with 180,000 current openings in construction, and 300,000 for financial services. The Department of Labor’s (DOL) Fiduciary Rules, designed to protect investors, and the Department of Transportation’s (DOT) new standards on qualifying natural gas infrastructure workers are just two examples of a changing work place and what is required to do the jobs of tomorrow. In both of these examples, new work-flows require better information and more formalized training and measurements of competency. Unfortunately, business bears the cost of compliance. This is at a time of dramatic fee compression, as technology disrupts old methods, and products and services are commoditized on a massive scale. Fortunately, we only have to look as far as WWII for the answer. The program that transformed these homemakers into the iconic “Rosie the Riveter” was created by the U.S government and was named Training Within Industry (TWI). In a nutshell, TWI systematically separates work into three distinct parts–job instruction, job methods and job relations–to address challenges of managing work-flow and training workers for any task. At the peak of WWII over 6 million women were in the workplace across the U.S., and when our soldiers came back to their jobs, TWI was shelved in the U.S.
After WWII, TWI found a new purpose in the Marshall Plan, supporting the recovery effort of Europe and Japan. In the 1970’s it fell into disuse but, today, the principles of TWI remain integral to the productivity of, not only many Japanese manufacturing companies like Toyota, but to businesses of every kind, thanks to Lean Manufacturing, Six Sigma, and other constant improvement programs. Today, data technology provides insights readily available to businesses, small and large, to: Understand behavior; forecast demand; innovate products; allocate resources; format training (from a live experience to passive video, interactive video, virtual reality and augmented reality); and measure results. Business Intelligence software like Tableau provides a cost effective way for businesses to ask new questions, spot trends, identify opportunities, and make data-driven decisions. This provides new and creative ways to apply human potential to add value and drive sustainable growth. From financial services to natural gas infrastructure, TWI provides a proven method to standardize any job. By integrating the latest technology within the principles of TWI, businesses can rapidly transform any work-flow process and build a workforce that is qualified to fulfill the jobs of tomorrow and beyond. 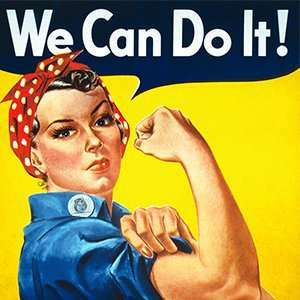 After 70 years, “Rosie the Riveter” remains an icon of American ingenuity and a powerful reminder that, no matter how challenging the task, there is a system that has stood the test of time and, best of all, it is part of our public domain.